Sometimes I take care of the kids for a few hours while my wife goes out. Other times, when she’s sick, I step in to help do some of her work and keep the household running. That’s what I’ve been doing the past few days. How she ever has dinner ready AND the house clean when I come home at night, I don’t know. It never happens when I’m in charge. On my watch, dinner is late (or messed up), books, toys, and couch cushions are strewn from one end of the house to the other, and oh yeah—I forgot to move the laundry again. It’s too many plates for me to spin at once! This never fails to be an eye-opening experience for me. How easily I forget the dedication, skill, and hard work it takes to care for a house full of little people. 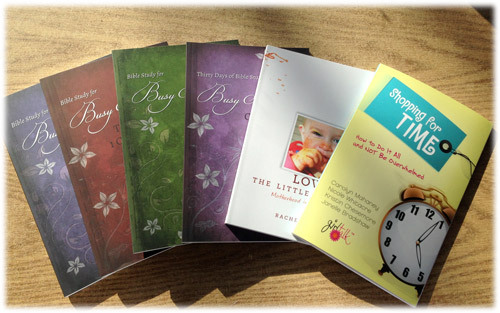 Just for fun today, we’re going to give away a “busy mama” book package including all our Busy Mamas Bible studies, Shopping for Time, and Loving the Little Years ($55 value). To enter the giveaway, just comment on this post with your answer to the question below. What’s one way your husband helps lighten your homemaking load or support you as a mom? My husband helps out a great deal when he can. However, he holds a job where he is gone 12 hours of the day, 5 days a week, so when he comes home he eats dinner quickly and entertains the children while I finish up whatever needs to be done. He also never once complains about if the house isn’t spotless, or if there’s a pile of laundry, he understands what my day consists of and always says rest…don’t worry about this or that, he’ll do it. My thoughtful husband always makes sure I have a full tank of gas. He takes our lo while i take a nice bubble bath. Peace and quiet for 30 minutes is beautiful! Two huge ways that my husband blesses me: he teaches our daughter history and science in our homeschooling and he washes the dishes about once a week. My husband is a firefighter, so he’s home alot. He helps in so many ways, but I love that he does most of the shopping. Because we homeschool, I feel like if I leave the house, the day is shot. My husband is so kind which is a huge blessing each day 🙂 He also prepares coffee or tea each morning and will help out with the laundry or dishes here and there throughout the week. I have an awesome husband! We have 4 (soon to be 5) kids all 11 and under. We homeschool, and some days are just hectic. I always feel like I haven’t done enough. Most of the time I wonder if anyone even notices or appreciates what I have done. Last weekend, my husband cooked for me TWICE in one day! That was a huge blessing; I felt like a pampered princess. 🙂 Although that was so sweet, it’s not something that he can always do. The thing he does more consistently, and it ALWAYS makes a difference is pray for me! A few times I’ve been in a moment of complete meltdown and he has just wrapped his arms around me and said, “Can I pray for you?” This season of life is challenging for sure. I am grateful to have a husband who helps guide me to the Lord in my moments of despair instead of trying to fix it all himself or just ignore me! IT blesses my heart and encourages me when I read or hear of a dad “stepping” in to help out his spouse. My husband will also help out as well. Seeing him at the sink or bending over a basket of laundry reminds me of how much he means to me. No, he doesn’t have to do any of it, but he does because he loves outside of himself. When he gets home from work he takes our 2 year old outside to play, which gives me the break I need after a long day! Being 3mos postpartum and being very prone to postpartum depression, my husband stays home with our three girls so I can go to the gym and run so I can keep my depression manageable. I am beyond blessed at how my husband helps…laundry, vacuuming, dinner, homeschooling! My husband works nights but when he’s not working he’s super helpful with getting the children bathed, family worship and makes sure my tank is always full. We have 6 blessings under 10years soon to be 7. My husband washes the dishes every night, vacuums, manages the kids’ bedtime routines, picks up groceries at the store on his way home from work, sometimes cooks dinner on weeknights, does all or most of the cooking on weekends, wet mops the floor, teaches science lab in our homeschool, etc. etc. I am blessed and spoiled. Thank you, God! My husband gets up at night to cover up my youngest when he calls for us (2 years old). We have a 4 year old girl that only wants me when she is up at night, so instead of me being up with both of them throughout the night, he takes calls from my son. It is immensely helpful! My husband helps out with washing dishes (we don’t have a dishwasher, so we hand wash all) and taking care of the budget & bills! our finances, grocery shopping, trash, grass cutting, and evening bible reading…and cheerfully with any other need I have, even though he has already worked his day and been up since 4:30 am returning sometimes as late as 7 or 8 pm. I couldn’t ask for a better Partner to share Family!!!! My husband doesn’t really help out around the house (but he works so hard to provide for us I cut him slack!) but he is good about seeing when I need a break and telling me to just go out for a couple of hours of alone time while he takes care of the kids. The house may be a mess when I get home but I appreciate the break nonetheless! My husband is the best! (No he’s not perfect by any means) He will change any diaper, sing to the little ones. Hold, and burp a baby. He will play hide and seek. He will cook supper. He will clean the house. He doesn’t expect there to always be a meat and potato supper on the table. Sometimes he is perfectly fine with a bowl of cereal for supper if a need arises to where a regular meal can’t (or I just don’t feel like cooking) be prepared. God hand picked my husband for me, and I am so very thankful that He did! My husband is an amazing cook. I love all his help in the kitchen. We homeschool and he does great helping the children with math problems that have me stumped. Mark often sees that would help make our home run more efficiently. I have always functioned better with order. Two nights ago, he stayed up late and went through our youngest daughter’s clothes, helping her weed out outgrown or worn out items. It is just like receiving a dozen roses to me….and a lot less expensive! He gets the kids ready for bed almost every night. That is such a big help after a long and busy day! My husband is AMAZING! I often say he should be the one staying home…..He jumps in and does whatever needs to be done and always tries to lighten my load no matter what task it is and NEVER complains. He is always appreciative about what it takes to run a hone and homeschool 5 kids under 12. He requires the kids to be appreciative and pitch in as well. Really it is teamwork and we make an awesome team! He always asks,”what can I do to help”since what may be most helpful changes moment by moment. Practically speaking he does dishes, laundry, picks up, gets up at night with kids, makes sure I get time to exercise or recharge throughout the week the list goes on and on. The most important thing is he keeps God first in our family, me, then the kids and does a great job keeping us a priority despite his busy schedule and makes me feel like the best wife and mom despite my many failings! I am loved and blessed by my dear, helpful, amazing husband! My husband is fantastic at overlooking what didn’t get done and praising what did get accomplished in my day. He never complains if he has to fish for matching socks from a clean pile of laundry sitting on the couch. He is happy to help out with dinner. If ever we are around people that may not approve of our Homeschooling he is great at jumping in and saying what a fantastic job I am doing and that our children are getting a better education than he did. My husband just jumps in where needed – putting away dishes, folding laundry with me, dishing up supper, and of course fixing computer problems and other broken things. put the children to bed. My “mommy button’ goes off after 8! As soon as my husband gets home, he helps with whatever needs to be done- making dinner, changing diapers, cleaning or laundry. He never puts pressure on me to get more done or that what is done isn’t good enough. Love him for that. He often asks me, “How can I help?” and then pitches in with whatever task is at hand! My husband is very helpful! My favorite thing he does to help me is folding laundry. With six kids under 10, including an three month old, I spend a huge amount of time cooking. My wonderful husband, does much of the cooking on the weekends, which is such a blessing to me. He does so many other things as well,but that one is probably my favourite! My husband helps with dishes, sometimes dinner, diapers, laundry, and bed time. He really is a blessing. I’m a momma to 10 children ages 15 – almost 2 yo with a husband who is a quadrapledgic due to an accident 2 1/2 years ago. He’s not able help me with his hands any longer like he use to but he allows me time away for ladies bible study or time with friends every now and then so I can get a little break and refreshing. Cooks dinner! Thankful for my wonderful husband! My husband of 20 yrs upon coming home asks what he can do to assist. This is before he turns to any tasks he may do for himself settling in from all day at work. He takes care of all hand-washed dishes. He handles baths for the little girls. He covers little girl bed-time. He prepares a special breakfast each one of us looks forward to every Friday. While there is tons to do each day he looks for what he can support when he is here. I am very thankful and our kids notice too. What a blessing. My husband is wonderful and helps out daily wherever. He always just pitches in. It’s a team effort. I’ve always appreciated that even though he has long work days he comes home and helps and doesn’t check out. My sweet hubby is always checking his email through the day in case he needs to pick up anything needed here at home. Sometimes it a head of lettuce for dinner or a random item to do science experiments later after he helps put the 3 yr old twins to bed. My husband takes the children outside to play while I prepare dinner. And he facilitates kitchen cleanup after dinner so I can have a some relaxation. Another area that my husband blesses me in is assisting with home educating. If one of our 5 children did not complete their work early during the day they have studyhall with dad. My husband will do the dishes a couple times a week. And often on Sunday mornings, since we observe the Saturday Sabbath, he will help out with whatever needs done even if it’s just getting the kids fed. My husband often comes home and rescues me. Lately he has come home during the lunch hour and prepared lunch while I am finishing lessons. When your with your children 24/7 it is such a blessing to have a break. I am so blessed by him! My husband helps so much with the kids. Playing with them, getting them ready for bed, reading to them, etc. My wonderful husband will check on me throughout the day while he’s at work, sending encouragement through texts. He goes by the store on the way home if needed. He is always stepping in to help with laundry, dishes, or cooking! These acts of service bless me and this comment has reminded me to voice my appreciation more often. My husband is always there when I need a break…regardless of what tasks need to be completed. And honestly, his encouragement that I am doing a fantastic job, even when I feel like I am not, does much more to help me that him actually completing any specific jobs. As a homeschooling family with four children, my husband makes it a priority to give me 1/2 day a week where he teaches and cares for the children. I use this time however I desire – I generally do things which will recharge and replenish myself. He helps make dinner sometimes. My hubby is off on Thursdays and he generally takes our very active three year old out so the older kids and I can focus on school more intensely. He also extends grace for what I perceive as shortcomings in homemaking. To get away to renew my mind. But around the house he is always so willin to do the laundry when it has been neglected to other things. Thank you, Doorposts, for the way you minister to so many families. I have forwarded your posts to countless others and have grown so much closer to the Lord through your posts, bible studies and resources. May the Lord bless you today!!! My husband loves to cook so that is taken care of by him. Our roles are switched right now because he is in college to get his masters and I am working. We have triplet girls who are 2. His mom retired last year and has been helping us out so we don’t have to pay for daycare. My husband is willing to do anything and everything in order for our family to be so dynamic and still do what we do. Roles will reverse again in February as he excepts a new job, we move two hours up the road, and we start a new chapter in out lives. I think the important thing is that both sides are willing to compromise and do whatever it takes to make the family thrive at its best!! Ah! Where to begin? My husband does many wonderful and helpful things. On a daily bases he washes dishes at night and often puts the little one to bed so I can start my winding down sooner. He will often “do projects” with our little one or take him on errands so I have some time at home to myself. He will also get our little guy out of bed in the morning so I can sleep a little longer. There’s just so much and I’m thankful for the opportunity to write it down so I can increase in my gratitude for him :). I have a unique situation in that my husband and are both work from home and he is absolutely my right hand in housework. We try to maintain things so that I am still the household “manager”, but he pitches in with everything from making the coffee in the morning, to switching laundry loads and folding during the day, to overseeing school work and chores, to helping with mealtime prep, to getting up at night with the toddler. He is an amazing help and I am so grateful! God has truly blessed me with a man who is humble and truly possesses a servant’s heart. really flexible in that if I don’t have something prepared, he cooks or reheats something which really helps me out in the morning. Also, on the weekends, he often helps with dinner– especially during the summer when we enjoy grilling. He’s always willing to help tag team the kids getting ready for bed–I’m gathering pajamas and he’s putting them on! One of the ways my husband helps me out is by doing the laundry. There are many other ways, too…I’m so very blessed. My husband gets up early every morning (even after working a late shift) to get our son who has Down syndrome and autism on the school bus. I literally couldn’t do it without him! I also love that he takes the boys outside to play everyday~weather permitting. Performing his roles of head of household, which manifests in praying for us, providing for us (allows me to stay home and homeschool), instructs us through devotions and questions posed to him, and stepping in to discipline a teenage boy when necessary are all ways my husband supports me. My husband is amazing. I have several chronic illnesses that prevent me from doing a lot of the physical work around the house. We have four children and he tells me to focus on them and their schooling and he’ll take care of the rest. He does most of the laundry (I help when I’m able), any dishes that need to be washed by hand, grocery shopping, vacuuming, etc. Basically any job that requires standing for a general length of time. He’s such a servant! My husband does all the grocery shopping for me! He asks me to text him our list, and after work he picks up what we need. If he does the grocery shopping on the weekend, he almost always takes a couple of our children along. This is a huge help to this busy mama! My hubby fully engaged and played with the kids after a long day of work, allowing me to focus and finish my work so we could both sit down together in the evening. He also gave me the night off EVERY Tuesday night after dinner. I often went to a coffee shop or bookstore and just crashed. After my third was born, he took the two oldest grocery shopping every Wednesday night after church while I got our baby into bed. It’s been ten years since we had toddlers, but I still remember those sacrifices. My husband helps in so many ways. He may cook dinner one night and do the dishes which is HUGE and I am so grateful. And other times he may do things that may seem so small at the time and go unnoticed by me until I reflect on what a wonderful man he and think of all of the wonderful ways that he supports our family. My husband works with our children to clean up dishes after supper. My husband does so much to bless me. We pray every morning as a family. That’s the biggest thing, I know we are starting our day of right. He also does things like dishes, he teaches math to our 2 oldest before he goes to work in the morning at 6am. Once a month he makes sure I go to a mom’s mingle at our church so I have so time with others. When I get home the house has been picked up and dishes are done. I could go on and on but that is just a few things. My husband is great at getting our kids to bed so I can rest or go out or run an errand. It helps so much! He also takes care of the heavy lifting projects at home. How easy it is to overlook the help I recieve from my husband because it’s a normal acurance. We have 6 kids (13, 12, 10, 8, 7, & 6 months) who I stay home with & homeschool. He always does the laundry, he sales chemicals, so he says he’ll handle it, because he knows how get all the stains out. He does the grocery shopping most of the time, he says its just easier for him to stop on his way home, than for me to go during the day with all the kids. Lastly he does bedtime, since I’m exhausted by that time. Thanks for the post, it is good to be reminded to be thankful of the help my husband offers me. I need to tell him thanks today! For a Mom who is busy all day, just a small break can mean so much. When my husband takes over for even 30 minutes to brush teeth and supervise bedtime routines, it is a great relief! If he takes all the kids out for a couple of hours on a Sat morning, he is giving me a precious gift of alone time and refreshment. When my husband sees me stressed …..He pulls me in close and holds me – he tells me to take a deep breath – he tells me to stop and reminds me that the have to’s I have imagined in my life are just that imagined and he tells me that all that is important is right in front of me and all around me – then he kisses me and asks me what he can do to help. It is the best and most loving moment! He does the dishes, love him!! These are such encouraging posts- we are so blessed to have faithful husbands. My husband cleans up the kitchen after dinner, cooks some weekends (yay! )when not working full time to provide for us he spends time with our kids. My husband puts the kids to bed and prays with them. My husband helps lighten my load by praying for me and our family daily. He also helps by offering to watch the children while I go out or go relax after a long day. The biggest way he helps is by encouraging me. If he cannot be there to help, because he is at work, he will say something to encourage me in my role as a mother. To me that is the best way that he lightens my load. My husband does a night bedtime bible study with five, 11-2 years olds, we are so blessed. My husband works very long and irregular scheduled hours. I am thankful he does work so hard to support our family so I can stay home full time to homeschool our children. He is willing to spend time with the children when he gets home so I can go for a walk or have a brief break. Also, he helps with some of the homeschool subjects when he has time, and he is willing to watch the children for me so I can attend a ladies Bible Study and have fellowship with other dear sisters in the Lord. I’m sure I don’t thank him enough! When my husband gets home he calls everyone in away from chores, homework and whatever we’re doing to play a game or two or three of marbles. We talk about our day and enjoy one another before going back to the grind. He is such a kid at heart. I tend to be more driven to get things done so it helps me to stop and enjoy the journey. My husband ensures the children are respectful and obedient. He reads to them every night. He keeps some of them when I grocery shop so I don’t have to take all of them to the store. He fixes things around the house and keeps our cars maintained. The list goes on….. When my 4th child was born in 5 years my husband started taking over the grocery shopping. Sometimes he did it late at night and on Saturdays he would take a child or two with him! Now we have 7 children and he recently orchestrated (with the Lords help!) a move for our family which now allows for him to work from home. This has been such a sacrifice of love for him to be with our children and for the multiple ways he blesses and helps me during the day. My husband likes to cook – so he does. He is home from work earlier than most, so it works well for him to handle supper so I can finish up school work with the kids. Yay! I’ve been sick the last 10 days and my husband has helped with the laundry, vacuuming, dishes, and has gotten our teenage daughters where they needed to be. He is a blessing, indeed. My incredible hubby is a morning person, so he takes our 2 and 4 year old every morning and makes them breakfast while the baby and I wake up, have our quiet time, and brush my teeth 🙂 it is so helpful for me to get my day started on the right foot!!! I’m so thankful he is so understanding. Love this questions and reading through the long list of wonderful things to be thankful for in our servant-leader men! As an introvert, true time alone helps me recharge my energy. He often (once a week or every other week sometimes) watches our son so I can leave the house for an hour or two and head to my local coffee place where I can catch up on some reading, planning, and writing. My husband always helps out with housework – whatever is needed, whether vacuuming, sweeping, dishes, etc. My husband never gives me a hard time about what I don’t manage to get done. He cooks dinner if he gets home early enough, will make quick runs to the store on his way home if I find I need something at the last minute, and he usually gets our three boys ready for bed. In general, he will help in any way I ask without grumbling or hesitating–what a blessing (and something I wish my kids would mimic already)! Also, he often buys me flowers when he makes his stops at the store. My husband gets up at 4 am several days a week. This allows him bible time and gym time before me or our 4 kids wakes up. This also allows me time in the evening because he is available to do the after dinner chores. He is very hands on when it comes to our young kids & the household & I so appreciate him! My husband unloads the dishwasher before he leaves for work in the morning to help me get a head start to the day. I could go on and on about all the ways he helps me. He’s amazing! My husband always helps me clean up the kitchen after supper each evening. He also often grabs a pile of laundry and folds it while watching TV. And every evening he helps put the kids to bed. It’s a good time for all of us, having Daddy involved. My husband has begun pushing me out of the kitchen at the 5 o’clock hour. Usually I have dinner bubbling, it just needs tended to or some veggies need chopped and added to the pot. These are things he can do so that I don’t have to juggle the dinner AND supervise the evening house straightening, table clearing, piano practicing, home work finishing. It has been nice being able to focus on cleaning up after a busy day of homeschooling and living life with 5 kiddos, 15months to 10years and not worrying about dinner burning or bubbling over. Thanks, babe! My husband sincerely thanks me multiple times a day for the chores I do. He tells me he loves me. And he washes the dinner dishes almost daily. My husband is great at helping out whenever I ask but he also cooks on the weekends to give me a break from the week. 1. My man LOVES laundry! 2. My man picks up the groceries. 3. My man plays hands-on games and teaches art to the kiddos. Wow… My husband supports our household in so many ways, that one is hard to narrow down. With that said… We have 4 children ages 17, 8, and almost 4 yr old twins. He has taken on this role since bringing our twins home from Ethiopia. It would be getting them ready for bed… Jammies, potty, brush teeth! Then family Bible time and off to bed. Just that little alone time to myself is refreshing, after a very busy day with very active twins! He listens! He also gives advice and talks to the kids about things when I ask him. My husband does the grocery shopping and he also does the vacuuming and mopping. He also either finishes dinner when he gets home or occupies our 5 sweet babes while I finish up! I am one SUPER blessed gal!! I truly appreciate when he quietly watches me and notices I’m a bit overwhelmed. Then, he jumps in to my quiet rescue. It may be unloading the dishwasher or helping to console and correct a whining child. I always let him know later how much it meant to me. It was perfect timing. My husband and I have 4 children ages 2-10 and one due in march. He helps me by keeping our little boys while my 8year old daughter and I go shopping. It is a nice break for me because we usually take our time and enjoy those couple of hours. He also likes to rotate the children and take a couple each time he gets a chance to go hunting. My husband helps to entertain the kids after dinner so I can clean up. My husband always has a way of making us smile and he likes cooking too! 1. Watches our 5 kids one night a week so I can go to exercise class and the grocery store. During that time, he directs the kids to complete a list I leave for them (kitchen chores, baths, etc). 2. Fixes his own breakfast on weekdays so I can have my quiet time before the kids get up. 3. Fixes breakfast on Sundays. 4. Teaches history to our oldest 2 children. …and so many other things! I am so thankful for him! My husband helps with a lot of the laundry. He works hard for our family outside the home but he always makes time for the kids when they want him to play…no matter how tired he is! I know this will be so meaningful to them one day. He’s also an excellent handyman and he can fix anything. He’s such a blessing to our family! My husband will sometimes be the substitute teacher for our homeschool. It’s so nice to be able to go out and not worry about catching up on school work! My husband helps with the laundry and usually makes our bed in the morning. He teaches our children the value of hard work. We recently had our 8th child and for some reason this season I just can’t get it together. I daily feel like I’m drowning, the biggest help to me is when my husband puts the kids to bed. I’m usually nursing baby to sleep so it works great especially when he does it on time. HUGE!!! It’s worth millions to me. I should probably tell him that!! Ha ha just thought of that! I would love to win the giveaway and feel like I wood greatly benefit from all of the resources!! My husband does his best to make sure I get a night to myself each week to recharge and refresh. Sometimes it means a few hours at a coffee shop catching up on my reading or writing, other times it’s a shopping trip to browse with no little ones, or an evening when he takes care of the routine while I work on artwork. My husband helps when he can, dishes, picking up, wrangling kids. Sometimes I think he would be better at this job than I am 🙂 But what helps me the most is when I get to watch him interact with the kids. God has grown him so much and he is so kind and gentle and loving… I really need that physical example of watching God’s love unfold. I get so bogged down in the daily stuff that it is easy for me to set aside the relationships to some extent, or react sinfully to so much. I am always gently convicted by my husband’s focus on them and his strive to be less selfish with his time. I am so thankful for my husband. My husband blesses me in so many ways, but I think what stands out the most is that he reads the Bible with us, teaches us how to be the Light and become more like Jesus. He also prays with me each night and with each of the children before bed. Another thing he does, which may seem so small, is he makes my coffee for me every morning. This is huge to me, because it is hard for me to get up so early on his work days. He gets up very early for work and I make breakfast…so having my coffee ready for me is such a blessing. It always brings a smile to my face first thing in the morning, because I know he cares and he loves me. My husband is a police officer, he likes to serve & protect; not clean & routine! He enjoys saving the day, I enjoy organizing it! I could not do what he does daily, and he is not made to do what I do. I tell him when he is messin’ with my nest – that I am going to prance into his office sit on his desk, chew on his pencils & all around cause a stir! He just laughs! My husband likes to be busy (although he would tell you different) when he is off work, he enjoys taking the girls to their activities or taking the grocery list or errand list & slaying that dragon. We have married for 11 years, he has learned what i need, and I have learned what he needs, but it is not always what we do well, sometimes it is just the effort! God Bless! thank you for asking this question, it has made me appreciate our God given differences & given me some clarity! My husband works a very physically demanding job. I know I could never do it. One way he helps out is by being a great “gap-filler.” The trash seems to magically empty itself. He’s willing to drop by the store to pick up the missed item from my grocery list. And when one of the girls has an exceptionally early drop-off for trips, he’s my man. It may not sound like much, but it means the world when my efforts can’t quite reach from end to end. I am truly blessed! My husband helps me by taking us all out one at a time on individual dates. This is two fold. It helps us to get the one on one time each of us need with him. And give him an opportunity to be purposeful with each one. The kids each have a special place they like to go. Some only like to go out for breakfast and others lunch. He also, takes them on errands when the opportunity arises. I am thankful for the part he shares in teaching the kids. Oh, he also answers the questions I can’t. My husband and I work together to accomplish what needs doing. For instance, when he gets home from work, we eat and after dinner if one of us starts washing dishes the other will dry. Or if the kids need baths, one will take over kitchen duty so the other can clean up the kids. We work together intuitively and peacefully. By doing this, we allow more time together as a family before the kids head to bed and more time to spent together as a couple after our wee ones are in dream land. It all comes down to doing what we can to help the other out to achieve the goal at hand. My husband is a huge help to me. Right now, I’m nine months pregnant with #6 and pregnancy does not come easy for me. He is a blessing to me but I look forward to getting back to my full capacity so the house can run smoothly again! My dear husband doesn’t mind doing laundry, so he’s taken that on as his one task outside of work. It’s a huge help to me, especially when things get hectic or I fall ill.
My husband James is a farmer, so when he is not in the field, he totes basketfuls of dirty or clean laundry up and down two flights of stairs (all bedrooms on second floor, laundry room in basement) which is MUCH appreciated! He is always willing to change a diaper or mop a sticky kitchen floor. He encourages me in the homeschooling. My husband is really a blessing to me. He helps me with anything I need. He does the laundry for me since our washer and dryer are in the unfinished basement so I don’t have to go down there and sometimes he does the dishes when I am wore out, as well as some nights he put the kids to bed himself so I can rest or get to bed early. He does this on top of his own school work that he has to do at night. He also fixes breakfast on Saturday so I have 1 meal I don’t have to cook every week. He is also a big help with homeschooling as he is my sounding board as well as the principal of our homeschool. He takes charge of the bedtime routine. Such a welcome relief to me at the end of the day! My husbands biggest blessing to me is that he watches our youngest when I am trying to get something done and she is fussy. Sometimes he reads to her or dances with her, sometimes he holds her and they take a nap together. My husband is awesome at cleaning up. Really, he does a lot but he does it so fast it’s hard for me to realize what exactly he is doing. I really can tell how much he does when he is gone on a business trip for a few months and it feels so much harder without him. My hubby is incredibly supportive of me. To help me with the household duties, he washes the dinner dishes every night, he does laundry on the weekends, he plays with the kids outside, he leads our family in prayer every night, and he tucks the kids in at night. My husband cooks for me frequently!! He also helps manage our 4 kids, one special needs, to get little projects and cleaning done around the house. And He never looks down on me or complains for not having the dishes washed or the house messy when he gets home! I am so blessed to have such a hands on husband!!! He watches the kids while I take a NAP on Saturdays!!! This is the ultimate gift to me! My husband helps out a great deal. He helps with dishes randomly and cleans all of the showers/tubs because I can’t with my asthma. weeks I am helping him more at the church he helps me more at the house. My husband has done many, many dishes for me and it is always such a blessing. I love when he does bath time, too. Those are just a couple of a much longer list. My husband helps by not making a big deal about having an orderly house each and everyday-even though I know he really loves it when the house is cleaned up. We do try to keep it as clean as possible while homeschooling 5 kiddos but his good spirit about it is very helpful. My hubby takes care of the outside stuff. He makes sure the van is working. He helps by taking care of his stuff so I don’t have to pick up after him. My wonderful husband comes home from work and usually takes our youngest outside so mama can have some quiet time. He has to get up early for work and he washes the baby bottles (that were soaking overnight in the sink) before he leaves. He does a lot more, but that particular gesture touches my heart because he’s sacrificing that precious time so that my day can run a little more smoothly. He occasionally does dishes and does all of the outdoor work like mowing the lawn and watering the garden. My husband is an amazing helper around the house. He does dishes often, bathes the little kids every night and does just about anything else he sees or that I ask for his help on! My husband is very supportive of me getting the time I need to take care of myself. Whether it’s time with God, time with the gal-pals, or time at the gym, he’s always quick to encourage me to go and holds down the home front while I’m out. He is also diligent to lead our family once a week for a special “family night” and indulges me once a week with a “date night”. His time is so precious as he works many hours each week, so I am thankful that he dedicates that precious time outside of work to me and the kids. My husband does the grocery shopping for me every Saturday morning. Using a grocery list that I prepared, he often brings some of the children with him. They love that special time! 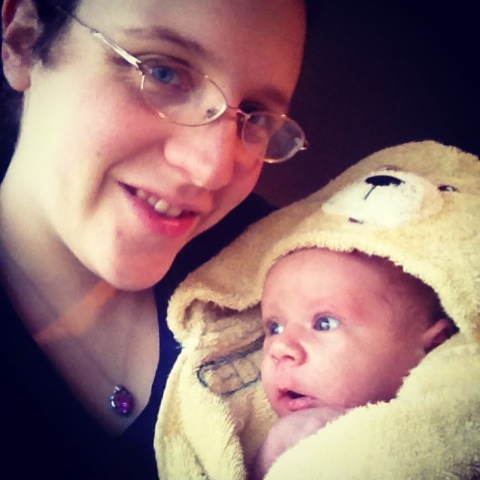 When I was pregnant with our second (we now have 5) I was unable to lean over the bath tub very well during bath time. He took over bath duty for me and I’ve never taken it back! 🙂 He doesn’t mind and it is one thing off of my plate. My husband has a day off during the week. While I’m homeschooling he runs all my errands for me. It is the best thing he could do for me because those things take up so much time and cause me stress. I’m so grateful he can help me out in that way. My husband does a load of laundry before he leaves and again before he goes to bed. That’s huge for me. He helps in million othere ways. Most important is that he just loves us so much. My husband doesn’t touch a dirty dish, but…He folds laundry! Especially when the pile is 4-5 loads high. That’s “his” thing. Oh! My husband is a blessing to me in so many ways! Just to name one I would probably say how awesome he is with our children. He changes diapers. He soothes fussy babies. He wrestles with the big kids. He kisses and hugs boo-boos away. He nutures them with Bible verses and stories. He is my hero! My husband LOVES to cook, so, if supper isn’t started when he gets home, he’ll make us something amazing! He is quick to help with the dishes. He also takes care of our animals and the garden and yard in the summertime. He blesses me in so many ways! This past year has been an especially difficult one for me mentally and emotionally. My hubby has sweetly taken over things like meal planning, grocery shopping and cooking, without complaining. I have been deeply humbled by his service to me and his tangible ways of loving me as Christ loves us. What a beautiful picture of God’s grace to us! Your Bible studies are my manna every morning, Pam. Thank you! First off– God bless you Daniel for being an observant, and appreciative husband! Like all of life, my husbands hands-on involvement at home has come in seasons. When the house was full of littles, including twins–he was extremely hands on with laundry, dishes etc. When I was so sick with morning sickness, he did the grocery shopping. Over the years as the children grew, and they took on many of those jobs, his life changed too. He had his own business for 6 years, which took so much energy, travel, and time. He sold the business, but now works about 50-60 hrs a week with miles of driving. As a wife and mom, having a husband gone for long days is difficult, even when the children are older–they almost need him more. But there is so much opportunity to trust in the Lord in each and every season of parenting. Learning to cut off my own will, and to be ever grateful that my husband has worked so hard all of these years, so that I could stay at home, raise these wonderful children and live like a Queen. My husband helps me the most by having intentional appointments with each of our children weekly. They return from this time filled up, in high spirits and cooperative–ready to serve and apply themselves. It makes all the difference for me as a mother. We start when our kids are three. For our boys, it is called “Boy’s Club” and they get up at 6am and go biking, hiking packing or sit on the curb and eat tamales (we live in Mexico). They do a study together (incidentally with our 14-year old my husband is working through “Because You Are Strong”–thank you! ), have prayer time, play a game, talk about their lives etc. For our daughter these are “Daddy Dates” which involve tickling, going to the park, reading books etc. A father can do a multitude of physical service to help, which is essential to keep the home functioning like a well-oiled machine. However, without the priority of relationship and discipleship poured into the children also from the father on a consistent basis, the mother is still left fainting for this is a job she simply cannot do alone. My husband always helps take care of the dinner dishes. It’s great to have the help, especially after cooking. My husband and I have been married for 23 years. He has always been a wonderful helper as we have raised our sons. I think the biggest help has been his going to the store on his way home from work and doing the grocery shopping from a list/meal plan I’ve created. That helped me SO much when the kids were little and he still does it for me even though the boys are 17&18! My husband works from home and helps out by keeping an ear on the laundry – changing it over when needed. He also helps keep the kitchen clean and steps in to discipline. My husband is amazing! Before coming home from work my husband will run into the store and pick up items for me. Saves me lots oftime! After my sweet, hard working man comes home, he sits down on the floor with the kids and play and talks with them. This allows for me to finish up things I didn’t get accomplished during the day! What a help! Love that man! My hubby is always willing to watch the girls solo so I can run around with no one needing me to finish up the days work or start on the following to make my day go easier! So grateful for my husband. Thankful for his prayers for me and our family. One thing I’m truly thankful for is that he never complains if some of the housework isn’t done. He’s always so appreciative for all my cooking and constantly comments on all the good food prepared (even though I’m not the greatest of cooks). Our young sons have started picking up on their father’s constant gratefulness for little things which is a wonderful blessing!!! me get up and going into my very busy day! The biggest help of all is my husband’s willing and understanding spirit to come along side me and help with whatever I’m behind on. No matter if it’s a chore he likes to do or not, he always helps without complaining. My husband helps in so many ways. He is always willing to step in and help with whatever is needed at the time. Anytime he sees a need, he will help out – including washing dishes, doing laundry, cleaning, making supper, taking care of the kids. During the times when things are running smoothly and it is not necessary for him to help in one of those ways, he will spend time with our children and express his appreciation for the work that I do with an encouraging word, kiss, &/or a hug. I am so grateful for him & for the example he is to our sons. My helpful husband loves to spend time with the kids, so he’s taught himself to play the piano and guitar. That way he can teach the kids in the evenings along with computer programming. This is such a help to me as I homeschool and am with the kids all day. My husband has always been one to “step up to the plate” when needed and never with being asked. I am beyond blessed with the help I get from him after having babies or when he’s home on a day off he always jumps in with homeschooling or taking time with the little ones so I can focus on school with the older children. Most recently we have suffered two miscarriages in the last six months, the last one being a few months along. It was very hard on all of us emotionally and me physically. I was very weak from blood loss and he took time off work and took over school, house cleaning and meals for two days while I was going through what I was physically. He was also there emotionally, holding me while I cried, praying for me and telling the children with me what was going on. I’m beyond blessed with the man God gifted me with. My husband works at home right now and he deals with the kid “issues” that come up. You did something naughty? Okay go see Daddy and confess it to him. =) He takes it from there. My husband telecommutes. In between typing and phone calls, he will correct work for our children. They know how important it is to let Daddy work. He knows how important he is to our kids! My husband helps me out when he can, especially if he sees that I am overwhelmed by what needs to be done or just need a rest. He is willing to help with the dishes, helping to fold the laundry, sweep and mop etc. He is also a great encourager of homeschooling out children. My dear husband suffers from a chronic pain issue and yet works to support our family. He is not able to help much at home but provides emotional support and loves to spend time with the children. I am never under the pressure to have a spotless house or to cook dinner every night. He reminds me that he knows how hard I work and that always makes me smile, that he thinks about that. He helps simply by loving all of us right where we are and encouraging us to take the next step on those tough days! My husband works 12 hrs a day 5 days a week, so he comes home exhausted. He is super helpful when he takes over bathtime for our 5 munchkins. He is always supportive and never critical! My husband LOVES to cook (and since I prefer not to cook) it helps me tremendously that he is willing to cook our meals. Dinner almost every night, plus breakfast and lunch whenever he is home for these meals. My sweet husband of 21 years makes the coffee and our bed every single morning. It’s simple, but helps me start my day in such a huge way! He also takes the early morning (5:30am) IV routine for our 13 year old with Cystic Fibrosis. He helps out when I need it and can do just about anything- cook, clean, keep kids on task. He will even stay home in the morning so I can get an occasional work out/prayer time with girlfriends. He is our running/XC coach and does most of their runs with them, takes them to Austin for long runs and rides his bike, etc. That is their “thing”. He also helps our oldest (age 17) with big research/thesis papers and reads to the youngest (age 9, who homeschools and doesn’t love to read…yet) Another huge help is that he manages the finances, which we’ve taken turns with over the years, and which I really appreciate! He is a wonderful helpmeet and my best friend! He washes the all dishes every day <3 I can't remember the last time I needed to fill the dishwasher! My husband held the baby last night so I could catch up on the dishes. Since our boys were babies, my husband has always handled their bedtimes. He uses this as a time to pray with them, read to them, and spend time in conversation. It has been a huge blessing to me to have that time in the evenings given to me, our boys adore that special time, and it blesses my husband and his relationship with our sons. Win. Win. Win! He really helps as much as he can when he is home! Reading all of the comments has brought tears to my eyes. I am so blessed by my husband. He is God’s gift to me, and we are a complement to each other in regard to strengths and weaknesses. My husband owns two businesses, and he has a very full schedule so I don’t ask for a lot. God has blessed us with having our home and business next door to each other, and my husband comes home for lunch when he can or we can take lunch to him. I do paperwork for his businesses and some rental property we have, and I also homeschool our kids. Some days I just need a simple dinner plan, and my husband never complains about what I cook (or don’t cook). Last week our six yo had the flu, and I reached a low point physically and emotionally. I was so blessed to be able to call my husband to come home from next door. He was very busy, but he was home in a few minutes. He prayed for our son, gave me a hug and kiss a big smile and encouragement. He was back to work in less than ten minutes, but it turned the tide in our home that day in many ways. He told me later that he was so glad I called him. I could go on and on about how wonderful he is (but I won’t) 😉 God is so good to me! I am blessed to have a husband that is able to see from the look of the house or the look on my face what kind of day I have had. He is always willing to entertain the kids, pick up the broom or vacuum, or whatever is needed. Just being a support and not judging my lack of ability some days to do it all is helpful and a blessing! I have a great husband who helps me out by working hard at his job every day! He helps me in lots of little ways by running errands, brushing kids teeth, supper dishes..the list could go on. I would LOVE to have this set of books so much! My husband helps in so many ways but the most helpful at the moment is grocery shopping. My husband helps out during the night with the needs of the littles! Sometimes….or a lot of times we have more than one up at the same time. He helps with laundry and dishes and other household chores when I’m behind! Sometimes late at night he does a grocery run for me! He gives me some time to myself and lets me sleep in some! He is an amazing support to me! My hubby is great about helping me with the laundry and dinner bc he knows my day us filled w homeschooling. Just recently he made and froze about 8 jars of salsa wout me asking!! Such a big help! I try to thank him daily for his help around the house! I have a wonderful husband! He cares so much for me. I have a couple of medical issues that leave me either in pain or tired, if not both, most of the time. When I am going through a rough patch, he enables me to rest by coming home and pitching in whenever he sees I have a need. The most humbling thing about it is that he is also a full time Bible college student! He will oftentimes put off doing homework until me, my 3 y/o and 1 y/o are all tucked in for the night. He could so easily choose to not get personally involved but he does, and he does so without complaining. I thank God for the man He made me for. I’m amazed at how perfect we are for each other. there are many things my wonderful husband does to help me. he’s started a habit of letting me sleep in most mornings to catch up on sleep. hes usually the one watching the kids when I’m grocery shopping. he often will be the one to get the kids ready for bed. all that he does is a great help to me and I’m so grateful for him! My husband does most of the shopping on the way home. 2015 has been a year of growth for my husband and me. I am learning when he just needs my moral support and he is learning when I need help around the house. He has taken over the duty of doing the dishes because of my horribly dry skin. He also tosses in a load of laundry when he starts running low on his clothes. I appreciate all he does for me! My husband always watches the kids while I grocery shop, makes sure they obey and talk to me with respect, and takes over math lessons when I’m at the end of my rope! My husband is very intune to my heart and not only does housework and stuff like that, he encourages me to explore interests and learn or try new things. His momma and dad did a great job at encouraging his care meter. I am very blessed indeed! My husband does some of the cooking and gets the children to school in the morning. He also gives me gifts of time where I can get away for an hour or two every few weeks. Just that alone time helps me to recharge and refocus. I come back from an outing feeling refreshed and ready to tackle my job as wife and mom again. I really miss them even though it is only a short break. There are so many ways my Husben helps me to keep things going. It is hard to pick one. He prayed for me that is a big help. He is a very organized person and I am not, he helps me organize the kids school, toys and time, this helps me stay on task and gets more done, I would be all over the place and start one job here then stop and remember something elts I was doing, then get overwhelmed with it all, God made him just for me I am so thankful . Thank you so much for the great give away! We live in a 3rd world country where there are many things I don’t have anymore that made taking care of home and homeschooling four kids easier… Like dish washer, or clothes dryer, etc. my sweet husband though takes the time out o his busy schedule to do all the big grocery shopping. Some ladies might think that would be good but he’s super thoughtful and almost always gets exactly what I want (even if it’s more expensive then he would like to pay:). That is a HUGE load off especially since the closest grocery store is 45 min away. He never complains and always calls when he’s shopping to be sure he’s getting what I need:). He’s such a blessing! One of my husbands love languages is acts of service and he often expresses this in various ways such as laundry, shopping, keeping the gas tank full and general picking up, assigning the children tasks and following up with them. Because this is not one of my primary love languages, it took me awhile to understand that he was doing these things because he wanted to bless me and not, as I thought, because he thought I wasn’t doing a good enough job. Your sweet wife is probably not as defensive was, but be sure to assure her that she’s doing great and that you’re just pitching in because you want to help. =) I have a wonderful husband and am SO thankful for him but I have often misunderstood him and his offers to help me out. My husband helps me in many ways. He always watches the children every evening so I can shower, helps swap out the laundry, helps with breakfast or watches children while I make it, takes one or more children shopping with him so I can have a break, prays for us, builds lots of things outside for us to do, fills the car up with gas and changes oil. He also works in our business 60-80 hours to per week!! What a blessing he is!! My husband makes Pizza every Friday night for our family pizza and movie night. I think I am MOST thankful for the prayers of support and strength my husband prays on behalf of our family. My dh will pretty much do whatever may need to be done. One of the biggest helps is taking the baby so I can cook or clean up dinner. Your post was a blessing. My husband supports my Saturday morning run by watching our two kids and sweeps and mops downstairs daily. I work part time in the evenings so he sees the daily struggle first hand. I love it when my husband does the supper dishes!! After a long day, I just love not having to do that job. My husband takes care of outside jobs and expresses continually how thankful he is that I stay home with the kids. My husband comes home from work and takes over bedtime! I am so grateful that he does baths every night and the kids love the extra special time with daddy. Along with bearing the responsibility of providing for all of us, my husband does so much work around the house- splitting wood, cleaning the chimney, fixing (or learning how to fix… thanks to youtube!) whatever breaks. He works awfully hard- I am so thankful for him! My husband is not very hands-on with the kids or housework, so at first I thought that I couldn’t answer this question. But the Lord convicted me and reminded me not to compare him to other husbands/fathers, but to be grateful for all that he does. So here goes: works side jobs to provide extra income so I can homeschool, handles all the mail and bills, buys birthday and Christmas gifts for extended family, handles all home and car maintenance (saves us a lot of money! ), cuts our boys’ and his own hair, repairs broken or damaged items quickly, keeps my computer up and running, takes the trash to the dump, shovels snow (we live in Maine, so that’s a big one! ), and many more things I am probably forgetting. Thank you, Daniel, for encouraging me to stop and appreciate all my husband does! After having our first child in June my husbandwalkwchanged jobs to come off the road from trucking so he could be with us and help where he could. He took about a 50% pay cut but real a huge increase since we get to see him everyday now. The first 4 months were hard since I was basically a single mom with him only being home 1 day a week. Now that he’s home he will occasionally do the dishes and wash up her bottles or do a load or two of laundry. The biggest help though has been the times he will stay with her so I can get away since I’m a stay at home mom. I know all the stay at home moms know a few hours away from all the hustle is wonderful even if all you do is just go for a walk. I am so thankful for the sacrifices my husband had given for our family. His spiritual leadership has been what keeps us strong as we worship and grow in Christ. My hubby is amazing! He gives me a ‘night off’ weekly if he can. I hide in our room & work on the to-do list I’ve prepared for myself throughout the week, things I can’t get done with little people around. Or watch a movie & have a night off! He also is always filling my gas tank & I don’t even realize it & gives many of the kids baths. Amazing! I love that he loves our family. He is an amazing guy I’ve been so blessed to grow with. I have wanted all my life to have my own babies & am so thankful for this family God has given me, but it’s also amazing how stressed out I can get with this wonderful life. The nights off has really been a sanity saver. My husband is always lending a hand with cleaning, carrying the laundry hamper downstairs & keeping the kiddos busy when I need a moment to prepare a meal. He is also very faithful in his study of the word & inspires me to study more hence making me a better wife & mother. He is truly a blessing. Well it looks like I’m not the only one who jumps at the opportunity to brag about their husband. But I’ll take it anyway. My husband is a first rate helper to me, his job and the church. I could go on and on but I’ll share just the most recent example. I wasn’t feeling well so this morning he offered to get up early and go into work early in case I needed to go to the doctors office. I decided I should go but that I could probably still manage taking our two little boys, 6 mos and 22 mos along. He said he’d come home from work so I could go alone. He watched them and changed them and kept them entertained until I got home. Now he says he’s willing to stay a little bit late too to make up the whole time he had to be away form the office. Considerate, willing, loving and flexible. I have a lot to be thankful for in my husband. My husband baths the children, tucks them in at night, does late night grocery trips, helps clear the table after meals, and never makes me feel as if I am behind on housework or not doing enough. He is so appreciative. This is a huge encouragement to me. He helps me with homeschool on his days off and does the laundry sometimes. He also watches the kids so I can go to ladies Bible study. We live in our travel trailer; we travel as we have the finances and my husband works fulltime when we don’t. It gets crowded with seven children! My husband makes sure I get out every week, we have a date every week, and tries to take all the children somewhere once a week so I have space to do things at home. We too have four little ones! My husband helps me out by watching the kids while I make dinner (if it’s not already done) and every night he is in charge of having them clean up the house before they go to bed, so I don’t have to spend the evening picking up after them! My husband has a long commute drive to/from work which means less time at home (he is also not very domestic), but he is always willing to do the grocery shopping on the way home which saves me time out of the house so I can focus on things at home. He has also been very understanding when I get overwhelmed, comforts me, and encourages me to not be so hard on myself. I love that we have a really good balance giving each other grace when we fall short. I have the sweetest husband. He not only jumps in when he gets home, but takes initiative in training our little ones in godliness. He washes me In the Word and makes sacrifices of his own time and schedule to serve us. I am blessed! My husband lightens my homemaking load and supports me as a mom by loving me well. He has studied me and knows me; he knows when I need a soft word, a sturdy encouragement, or a loving rebuke. He knows when the pile of dishes threaten to make me cry, and resists complaining when he has to reach into his “emergency stash” of clean underwear because I didn’t finish the laundry. He points me back to Christ, and would be thrilled and eager for me to carve out time for personal bible studies such as these. Thanks for this great question. It’s always a blessing to stop and think of reasons to be grateful! My husband does the shopping for me and does the kids’ bedtime routine with them! Both are such a HUGE blessing in helping me! We have 5 kids; 2 amazing sons with type 1 diabetes, 2 precious girls with celiac disease and a sweet 8 month old son. I homeschool and work full time from home and my husband works also. We have to get up during the night to check the boys’ blood sugars. With a nursing little one it is a challenge to manage both some nights. My husband has to be up for work some mornings at 3 am but never the less he gets up in the middle of the night, some nights multiple times to help with the boys. He is always so caring towards them no matter how late it is. I am so blessed! He does ALL of the yard work and plays with our youngest almost every evening! Also works hard and for the past 21 years I have been able to stay home and homeschool, which is what I feel God calling me to do! My husband does the dishes! I cannot stand doing dishes by hand, but he actually likes it & thinks it is relaxing. He said it helps to get his man hands clean, too. My husband makes dinner every night while I go to work! My husband will take the girls out for a few hours so I can have time to myself or with friends. My husband washes the dishes after dinner each night and cleans up the kitchen. He also often facilitates having the kids clean up the living room or their rooms. before dinner time. So thankful for his servants heart and wonderful help! My husband helps by playing with our boys after dinner so I can get the kitchen cleaned up. He also vacuums when needed without complaining. And on Tuesdays, he focuses on our older boy outside of the house so they get quality time and I get productivity time while the little brother naps. . Even after his long day, he baths and reads to the kiddos while I clean up the kitchen after dinner. Sweet hubby! My husband helps by letting me get a nap in on the weekend. It helps me start my week out feeling extra rested! just being home causes the kids to do a 180 and they behave and are calm. well, if he is not “present” but home, that doesn’t work. so, i guess just being the wrangler is helpful! Ryan consistently does the dishes and gets the kids in their pajamas while I finally get a shower, which doesn’t happen most mornings since our youngest now has special needs and my mornings are full of caring for him and our three other young children. My husband is incredible & does so much to help me in too many ways to count! One of the biggest things that helps me is that he’s happy to jump right in as soon as he gets home from work to do whatever best helps me. So thankful for this man! My husband helps me anyway he can. I thank God that He blessed me with such a wonderful husband. I think my favorite thing he does, is helping with our little ones. He gets home in the evening and he’s always so willing to jump right in. If a diaper needs changed, someone needs some extra attention, even just holding our 2 month old so I can eat my dinner peacefully. He really is an amazing husband. Ken never lets me give up! He is my cheerleader! And he is always ready to engage when he gets home! Until I read these posts, I dont think I realized just how much my husband has done and still does. He has always done jobs I don’t like to do, but I think the most precious example is that when our little ones were sick, he would clean up after them, so I could rock and hold them. I need to encourage my husband more often! My husband’s work schedule is 12hrs a day (night shift) with a 7 day on, 2 day of week. Yet he still manages to get up in the morning to help get the kids ready for their school day and help with laundry & food shopping when I am at my part time job. My hubby loves to run errands for me! He also enjoys spending time with the kids when I need to get something done or just need a few minutes to myself. Seriously though–he spends all day as a counselor talking to hurting people. But I am amazed that he always makes time to talk with me at the end of the day–listening, but also encouraging. I ♡ hearing about all the ways Husband’s help their families. It is a great reminder that God has called each man and woman to a unique role in life. I continue to pray for the Man God has planned to bring into our lives to lead our home closer to him. I hope he is like many of your husbands. I am thankful for the “umbrella” of protection that my husband intentionally puts over me. Weekly, he protects me by not allowing me to commit to too much, and now that the kids are older he has check points and checklists that he holds them accountable for. This lifts a HUGE weight off of me. My hubby has made sure that we have a weekly date night. We’re now in our thirteenth year. I love our Friday night dates, it’s my favorite day of the week. My wonderful husbanded does an excellent job of caring for, and training our four small children. His greatest act for me is keeping touch throughout the long days via text 🙂 Sometimes he sends pictures of what he is doing for us to see (he farms, so the scene is always changing! ), but often it is a simple ‘xo’ just for me. No matter how long the day has been, or how weary I am, that is a text that always makes me smile; and reminds me how blessed I am to be his. My husband does bath time for our kids every bath night. May sound minor, but it is so helpful! My husband helps with bath time and bed time which allows me time to do bible study in the evenings. It’s helpful for me to regroup and just take a few minutes for “me” because getting spiritually filled back up makes all the difference! When my husband thanks me for the work I do and values the little things the children and I are daily persevering in, it is very encouraging. I am encouraged, too, when I see him working hard and purposing to be diligent in family worship and time spent with our children. My husband is always willing to do the dishes and vaccum. Love that. So I am positive I am married to the greatest man on earth. That being said, I love reading all of the wonderful things women are saying about their husbands! This is bringing such Glory to God! We have a very blessed lifestyle. We are farmers which means my husband is never more than 6 or 7 miles from the house. We have 4 sweet children and expecting our fifth. We homeschool, which gives my children the opportunity to go with my husband while we are calving or planting corn or doing other life experience jobs. I have never seen a man, such as my husband, so hands on with his children. We (the children and I) are the cherries to his sundae. The stability, strength and tenderness that he possesses are better than any house chores. Praise You God for Your Creation, marriage and families! He offers to pick up dinner on his way home and sends me to take a hot bath. Daniel, thank you for your honesty! My husband had the same experience when I went out of town a couple of times and he was completely in charge. My husband is Mr. Fix-It. He keeps things in good working order, cares for our enormous yard/property, and helps with deep cleaning projects (such as moving furniture and scrubbing wood floors and base boards). I enjoyed reading this post because it made me really think about how my own husband tries to help. I had a very bad migraine recently and I was still trying to “run” everything but couldn’t and he told me to rest in bed and not worry. He had all the children help in whatever needed done, saw to dinner and had the children chck in to see if I needed fesh ice packs, water or anything. I am so blessed and thankful. Also to realize he is there to help and I should accept help too when needed. My husband always bathes, brushes teeth and tucks all the children in at night often with songs and stories (we have six ages 10 and under). This allows me somewhat quiet and alone time picking up the kitchen at night. He is always willing to help out and do whatever I need or ask of him. My husband dries the dishes at night. He also helps with the laundry when needed. One of the best ways my husband helps around the house is to help me say no to too many outside activities. If I’m home, I can get my work done and spend time with my family. Sometimes we even do chores together, so then look how much gets done! My husband works form home, so he is a big help with keeping the kids on task. He is also forever doing laundry and dishes (just started a load of dishes, as a matter of fact! ), picking up, etc. He also greatly supports our homeschooling, and does his best to encourage me when I am having a “failure day”. When he’s not out of town for work, my husband helps get the kids in and out of the bath and gets them ready for bed. On weekends, he’ll run extra loads of laundry through and hang them out to dry. He also grills out on grocery day so I don’t have to worry about groceries in addition to grocery shopping and putting away. Honestly, the fact that my husband provides so well for us financially and allows me to be home with our children and teach them means so much to me and helps me tremendously. What a blessing he is! We have 3 children aged 5, 7 and 9. My husband works shift-work and has crazy hours. The few mornings that he is home and not sleeping from the night shift, he will make breakfast for the kids so I can get caught up on something or get an early start organizing our day. That is a treat for me. On those days, he will also try to do a little bible study with either the younger 2 or the oldest while I spend focused time with the others. It’s refreshing to have some help and the kids enjoy the one- on-one time with Dad! I’m thankful my husband comes home every evening to spend time with us. Just seeing him walk in that door is emotionally relaxing! And then he brushes the little ones’ teeth, sweeps the floor while we clear up the dishes, puts bandaids on our owies, listens to our concerns, fixes all the broken toys, etc. It’s very emotionally satisfying to have him around! I appreciate that he takes care of all the “bigger” projects around the house so I don’t even have to think about them. Things such as making sure the cars are all in working order, having enough chopped wood for the winter, fixing things around the house that I don’t even notice need fixing sometimes. I also love that he makes breakfast almost every Saturday and Sunday morning. On Sunday he also helps get the kids ready for church so I can spend the time I need to get ready without to many interruptions. My husband works 24 hr shifts on a rotating schedule but when he is home he plays with the kids while i make dinner and helps with bath and bedtimes. He also keeps them when i go to the grocery store so i can have a little peace and quiet while i shop. My husband is wonderfully helpful with many things in and around our home! One of the biggest blessings to me is that he does the bedtime routine with the kids every night. It is a special time for them to share together and helps me a ton at the end of a long homeschool day! My husband prays for our children and for me every morning. He works long hours to provide for all 10 of us. He keeps our old vehicles working, our old appliances working, and fixes everything that needs to be fixed. If things need to be done around the house (laundry, cooking, cleaning, etc) that I can’t do, when they need to be done, and he can do them, he will. My husband takes our disabled teenage son to his doctor appointments. He takes our daughter to her neurology appointments that are a 6 hour round tip drive away. He painstakingly researches about our children’s (4 of 8) various physical and mental disabilities and works with me to help our children succeed in spite of their disabilities. My husband helps with homeschooling our children, especially high school level math and science. I feel very blessed to have the husband I have and try to tell him so as often as I can. He tells me often that he is blessed to have me and our children. My husband pays attention to my needs and does what he can to fill in the gaps in every area of the home. We had a baby a month ago, and he’s been sleeping in my daughter’s room while I tend the newborn just so he can be rested enough to work full-time AND fill in the gaps. Specifically tonight he saw that my 4-yr-old had an attitude before bath time. He took over so I wouldn’t have a chance to lose my cool. I was able to finish dinner cleanup, tend to the newborn and the 2-yr-old, and gather a few biblical resources to calmly sit down with my daughter after her bath to discuss the poor attitude and how the situation can go a little smoother in the future. Yesterday he brought me a breakfast burrito and told me I didn’t have to share it with anyone. I did share it, of course, with the little ones and enjoyed it thoroughly! There isn’t time nor space to clearly articulate how my husband helps me each day… as we come to our 13,000th day -a-versary, he keeps communication lines open with all the children while working 18-20 hour days consistently. He has allowed me to stay at home, except for a brief time when he was finishing graduate school. He washed cloth diapers for all the children and not one complaint. Thank you God for your gift of a husband made just for me! Praise God for husbands! I’m so thankful for the man God has given me. So many things I could say, but I think the thing that is most helpful to me is the way my husband supports and encourages me. He will always make himself available to listen to a problem or frustration and has incredible wisdom to offer. He works hard at making sure my emotional/ spiritual needs are being met. 🙂 and he does the same for our 7 children!! My husband will take the children on overnight get aways or day trips occasionally. When our 10th child was born he took the others on a weekend trip to Chicago. It was a huge blessing to rest in a quiet house. My husband is incredibly helpful in both “blue” and “pink” job areas. 😉 He’s just as comfortable working on our vehicles and hauling firewood as he is washing dishes, doing a Costco run, and reading nighttime stories. But, sometimes he’s the most help with what he DOESN’T do. He doesn’t comment negatively when all is crazy here, he doesn’t complain when dinner is a bowl of beans, again. He doesn’t sigh and groan when I clearly can’t do it all and I request he lend a hand. He is truly a treasure and I can’t imagine sharing life, love and kiddos with anyone else! My husband is the store manager of a pizza place and usually, even his days off are full of texts and calls and checking in. I’m sure that one day, this will be less, but he’s been the manager for less than a year and their numbers aren’t consistently where they need to be. Not to mention he’s short-staffed. So as much as I’d love for him to be able to lighten my load, we’re really in a season where that isn’t possible for him. Instead, I try to hold down the fort so that when he comes home, he doesn’t have to wade through toys to sit on the couch or come up with his own dinner, even though we ate hours before. My kids miss him so much because he works so many hours, the only thing I really expect from him when he gets home is that he cuddle with them and spend time with them so that they can feel that he still loves them. Before he got his job with this company, we went through 13 months of unemployment, so it’s been quite a change to go from Daddy all the time to Daddy for a few hours a day, if we’re lucky. Usually from Monday afternoon until Wednesday morning, they don’t see him at all. I try to make sure that when the kids start to feel it, he makes time to do something with them one on one. We’ll probably have some of that on Saturday, since he won’t have a day off next week at all. My husband blesses me by telling me he appreciates the hard work I’m doing, and that I’m doing a good job w/homeschooling, helping w/laundry, and taking the LO’s out so I can have time for myself. My husband does a lot of grilling in the summer so I don’t have to cook. In the winter he keeps the kids busy while I cook. He is always available during the day for a quick word of encouragement by phone. I have a very supportive husband who helps me in countless ways. I work from home so it’s always wonderful how he pitches in and manages things on his days off while I work. Cooking (he’s an excellent cook! ), washing dishes, taking out the garbage, babysitting. My elderly grandmother lives with us and he helps with her needs, as well. Most importantly to me, though, he is never critical of my housekeeping and even on the really crazy days when I’ve had no time for straightening things up or cleaning he still tells me I’m amazing and he doesn’t know how I do it all! I love him so much! My wonderful husband is so good at seeing what needs to be done and pitching in to help without my even asking him to. That is especially helpful because I often feel guilty asking for help! He is always encouraging, and never complains when he gets home from work and the house is still a mess and dinner still needs to be prepared. He is truly a gift from the Lord. My husband always gives me my choice of cleaning up the supper dishes or playing with the kids while he does. He is always helpful around the house when he’s not at work. I so appreciate him! I am so thankful to have a husband who loves the Lord and seeks His best for our family. That is the first way he lightens my load. He also works very hard so that I can be home with the kids to homeschool and manage the home (something God changed in my heart after I left a successful career 15 years ago). He never complains about anything I prepare meal-wise, or about the status of the house. He is very thankful for what he is given. He is always ready to lend a hand with any type of housework without complaint. My husband has a very physically demanding job, but that never stops him from wrestling around and playing with our 5 children as soon as he walks in the door. It helps me finish what I need to get supper on the table or it’s just a great distraction for that whiny time period before kids eat. Hearing his truck pull up in the drive is music to my ears! My husband is awesome, he is super understanding that we both work all day and the house is not going to be spotless everyday. Not nagging is really quite helpful. And, this may sound dumb, but my husband lets me take a long shower without the kids bothering me. This is not really house work, but it helps with my sanity. Just that little bit of time alone to regroup really means a lot to me. My wonderful husband gets up with the 3 year old every night and lets me sleep! He also does the bedtime reading with the older kids so that I can have 10 minutes to myself to decompress before sharing time with him. And I know, most importantly, he prays for me throughout the day. I love him so! I am blessed with a wonderful husband too… he helps me in so many ways, I feel guilty at times! He often comes in from a long day of work and asks “What can I do?” He’ll take the kids for a walk while I finish up dinner, he does bath time and helps with bed time…. he does dinner dishes as often as I do. I could go on and on. Thanks to all the husbands who work hard to help their wives! My husband blesses me by making breakfast and lunch on Fridays and Saturdays. My husband helps me with the home by making all the dinners for the week on the weekend. Then we just have to pick what we want for dinner and warm it up. It is a huge time saver and helps so much when you have to start taking the kids to all of their activities. A few times a week, my hubby washes the dishes and will wash/fold clothes. He keeps the kids on Mondays while I work, and he also does a lot of handyman projects around the house and will build furniture for us whenever I ask. This alone saves us lots of money. All I have to do is design it and he will build it, I love that!!! What a blessing he is. He also always comes grocery shopping with me and will do mostly all of the loading and unloading. We worked to get debt-free for over a year and then my husband quit his job to stay at home with our daughter (from age 1.5 to 5). It was the best experience for both of them (and for me too). I’m tearing up as I write this. What a joy to know that while I was at work, they were bonding and playing (one day I got a call to tell me they had built a raft and were getting ready to float down the creek…what an adventure that turned out to be!). My husband didn’t have dinner ready. He hadn’t done the laundry. But, he loved me and her so much that he became her full time caregiver… for a time. Sometimes the best way my husband helps out is playing with the little ones or putting them to bed. We have 6 and it seems like someone always needs my attention. When he draws their attention to him and I have a bit of quiet time house work is easy and even enjoyable. Other times I like to relax with a book or go to bed early. Two things my husband takes charge of and takes off my shoulders..
1. He always handles bath time for the little ones! It gives me that extra time to clean up the kitchen after supper in silence….love it! 2. On the weekends, he takes over breakfast. I look forward to enjoying a full cup of coffee every Saturday morning! He changes diapers, give ltitle gals their baths, helps with supper, does laundry, helps pick up. I love that man! We just had our seventh child. My husband took off work for three weeks when she was born. Our other children were sick, so while the baby and I stayed back in my bedroom, my husband took care of all the other kids, cooked all the meals, did the grocery shopping, and kept the house running. He still found time to bring me coffee every morning before I got out of bed and wonderful meals and snacks all throughout the day. He even woke up with me during the night to offer support as I was taking care of the baby. He normally works long hours, so it was a sweet time for him to be with the kids. I loved hearing him playing with them, reading to them, doing devotions. As wonderful as all those things are, I think the most important way he supports me is by assuming the main responsibility of teaching and disciplining our children. I am at home with them full time, homeschooling and handling daily life, but he stays involved and aware of what is going on with each child. My sweetie is getting more and more handy at fixing things! He’s great at it and it has saved us a bundle more than once! The list is endless!! I love when he cons on the weekend. Thanks for the giveaway. Haha. Silly autocorrect…that should be cooks!!! My hubby goes grocery shopping. He does dishes and entertains kids. He prays for me and loves abundantly. My husband occasionally cooks, helps clean up after meals, and takes the kids on outings so that I can have some quiet time. My husband is wonderful about helping out however he can. He works in the evening but often fixes wonderful food for us while he is home in the morning. He is also great at asking what he can do to help and taking care of the little ones on occasion. He is also great at taking over with the kids sometimes just so I can get an uninterrupted, unhurried, relaxing shower – that’s definitely one of my favorite things 🙂 My husband is a huge blessing to me and I am very grateful for him! We have four children who are just now ages five and under. Since the birth of our twins, my husband has been extra-involved in helping with household chores. We split the dinner dishes and bath time duties. (He washes a lot of dishes – even on non bath nights!). We also live in New York City and do not have our own washing machine. My husband has done the majority of the laundry duties for the last 18 months. On days when he works late or weekends when he travels for ministry, I am exhausted and lost without his help! First, he takes care of all the financial stuff – something I do not like to deal with. Second, he tries to help around the house with dishes, laundry, etc. when he has the time. Third, he has recently been doing most of the errands – although that normally involves about 20 phone calls per outing. Fourth, he keeps the younger ones from making to much noise near me when I have a migraine. My husband helps out by washing dishes sometimes, working in our garden, helps with canning our food, and watches our grandboy when I need him to. He is all ways at ball practice as well. Helps as much as he can! Where do I begin? There are so many ways my husband is a blessing and encouragement to me! One thing that has been helpful lately is that almost every morning he makes breakfast. Our youngest is three months old, and him making breakfast allows me to take care of her morning feed, or grab a few more minutes of sleep. This is just one small example of many I could say! My husband reminds me to relax and seek God’s priorities for each day. He jumps right in after work and helps counsel or entertain one of our 4 children. He prays for me each morning and asks me each night what I need. He is loving, hard working, and willing to help! After reading the comments, I found myself feeling slightly jealous, especially of the ones whose husbands are kind and patient. But then I chastised myself, and said, I need to think on the good that my husband does for me. So I began to think, and I am thankful that my husband keeps the house clean. I just started homeschooling my step-son, who is 11. He was very behind in school, so we made the decision to pull him from public school to make sure he gets a good education. We also have a 4 year old, 3 year old, 2 year old twins, and a 6 month old. We are blessed to be able to keep them at home, and I am blessed to have a husband that cares for the home, while I tend mainly to the children and other household needs. My hubby always willingly stops by the store on the way home or runs out for whatever I may need on short notice, so I don’t have to. He also keeps my gas tank full! The greatest gift I have received in the 30+ years my husband, Mark and I have been married is his daily leading our family in study of God’s Word. He has persevered when he was the only one who wanted to be there….and God has blessed him and our entire family. Not all of our children appreciated it, and sadly, I didn’t always see it as a blessing — but now that 5 of our 9 are grown, they have stated over and over how that has impacted their lives. “God’s Word will not return void”, “Faith comes by hearing” & ” Do not grow weary in well-doing” — He has staked his life on those truths. I (we) are forever grateful to him for that. My husband works tirelessly to earn a good living for our family of 12, and lets us all know he would rather be with us than anywhere else. Our kids range in age from 8 yrs-28 yrs, and a few of the older ones are on their own now, but when they are here, he keeps watch over their souls, and gives them practical wisdom talks to live by. And he also makes sure their various vehicles, mine too, are always ttuned up, in alignment, does the oil changes, everything to be safe on the road. at home he reaches the high corners and dusts away spider webs, and is also the best with a vacuum. He keeps up with bills and paperwork, so I can be free for other more enjoyable household duties. And best of all, he could change a diaper like a pro, and always volunteered to clean up the messes associated with stomach flu….which always bowled me right over. He would do anything for our family! My Loving husband will cook and clean up whenever he is home or when we have guests over. He’s also great at giving me time to get things done while he plays a board game with our 3 children or taking them on fun errands like antique shopping or playing at the park. I Love my husband and I’m so Thankful he chose me to be his wife! My husband lightens my load by listening and providing wise counsel. We have six children ranging in age from 3 to 26. I regularly encounter situations where I need his insight and different perspective to best solve or deal with an issue. He works long days, but always takes the time to listen and support. My hubby does all the Costco and grocery shopping! My hubby does all the Costco and grocery shopping for our family every week. My husband does not do anything around the house to help out. All cooking, cleaning, homeschooling, church, sabbath school, etc…, is all on me. He does work 6-12’s every week. I’m thankful he works as much as he does to provide for our family, but a little help would be greatly appreciated. Derek helps me by working so hard so I don’t have to worry about working outside of our home. I am able to stay home with our 4 small children (currently pregnant as well). I couldn’t imagine working and doing all the cooking, cleaning and child rearing or worse having to pay someone else to do those things for us. I’m VERY blessed I get to be home everyday. It’s so awesome to hear how all these men are serving. I’m definitely going to have to steal some of these ideas. Thanks to all of you for sharing. We just drew the winner of the giveaway: Laura, with comment #240! He took over Math this year with 2 kids and always helps wash laundry among other odds and ends. Always takes out trash and recycling and makes sure each bathroom has lots of toilet paper!